Cinnamon Essential Oil, which comes from Cinnamomum Zeylanicum, also known as Cinnamomum Verum, is in many ways very similar to Cassia Essential Oil. It also has powerful anti-rheumatic properties, is great for aiding healing from colds and flu, as well as many other things. 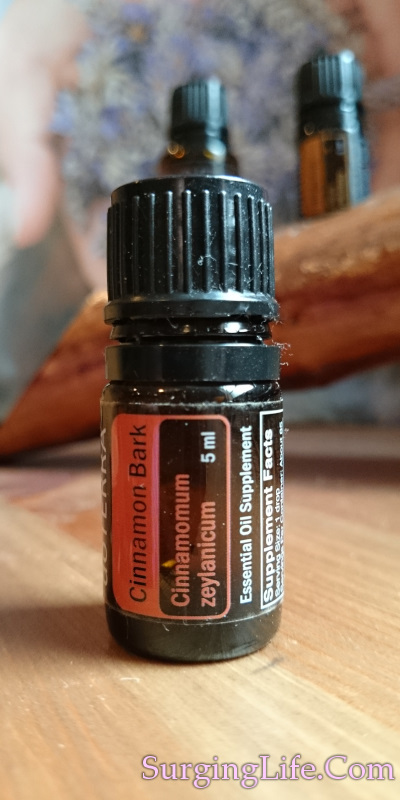 You can discover more about Cinnamon Essential Oil Uses further down this page, plus both the Bark and Leaf have their own specific pages with links below. The key difference between the oil from the bark and the leaf is the chemical composition, whilst they share some commonality there are some notable differences and you should always be fully aware of which you are using for very distinct reasons. Cinnamomum Zeylanicum is commonly referred to as Ceylon, Sychelles, Madagascar and also true Cinnamon. It is a native of Sri Lanka, the original name of Zeylanicum draws it name from the countrys former name of Ceylon. It is an evergreen tree which can grow to around 15 meters in height, with deep green leaves that vary from 7 to 18 centimeters in length. India and Sri Lanka are well known for the growing of this tree. The Cinnamomum Zeylancium essential oil is extracted from the bark or leaves via steam distillation, the two providing oils of different composition. The oil itself is a yellowish colour and clear in nature, with a thin viscosity. The aroma has a middle note which is warm, musky and spicy in character. For the bark derived oil the aroma has the familiar Cinnamon smell, whereas the leaf derived oil is more akin to the aroma of Cloves. The principle constituents that yield the properties of the leaf oil are eugenol, eugenol acetate, cinnamic aldehyde, benzyl benzoate, linalol, carophyllene and cinnamaldehyde. The principle constituents that yield the properties of the bark oil is cinnamaldehyde which accounts for between 40% and 70 % of the composition, a far higher concentration than that of the leaf. Also present are eugenol and cinnamyl acetate, plus other minor amounts of additional useful compounds. If using Cinnamon Bark essential oil you should always use it in dillution. Cinnamic Aldehyde and Eugenol can cause irritation, notably with mucus membranes. As such is should be used with according care. In diffusers use sparingly, and when used in contact with skin use in dilute form with a carrier oil. Check dilution levels on a small patch of skin, such that only a warming sensation is felt, this can vary from person to person. High doses can trigger convulsions, so be careful how much you use. Also avoid during pregnacy as it is an emmenagogue, though it has been known to be used as a sedative during birth. Increasing antibiotic activity against a multidrug-resistant Acinetobacter spp by essential oils of Citrus limon and Cinnamomum zeylanicum. "The genus Acinetobacter has gained importance in recent years due to involvement in serious infections and antimicrobial resistance. Many plants have been evaluated not only for direct antimicrobial activity, but also as resistance modifying agents... The results of this study suggest that essential oil of C. limon and C. zeylanicum may suppress the growth of Acinetobacter species and could be a source of metabolites with antibacterial modifying activity." Guerra FQ, Mendes JM, Sousa JP, Morais-Braga MF, Santos BH, Melo Coutinho HD, Lima Ede O.
Nat Prod Res. 2012;26(23):2235-8. doi: 10.1080/14786419.2011.647019. Epub 2011 Dec 23. Cinnamon essential oil comes in two forms, that derived from the bark and that which comes from the leaf. They hold many similar properties, yet their compositions are very different. They both help with a variety of Rheumatic issues, including Arthritis, for which their warming and stimulating natures help to promote greater health, whilst their anti-inflammatory and analgesic natures respectively help to reduce pain in the areas treated. Both are emmenagogues, and as such should both be avoided during pregnancy. Whilst their composition is greatly different, based mainly on the content of cinnamaldehyde and eugenol, they can still both cause some unpleasant effects for some people. Irritation of the mucous membranes is one of these things. As a result it is always worth patch testing with Cinnamon oils before full usage. This can be done relatively easily, creating a 1% solution with a carrier oil, and then applying a small amount to a small patch of skin. The back of the hand can be a good place due to the sensitivity of the skin, you will know fairly quickly if there are any adverse effects, and be abe to cleanse the area with ease if needed. When using either of the oils after patch testing stick to a 1% solution, you can blend with other oils if you wish though 1% is a good figure to stick to for Cinnamon. Also stick to topical usage unless using a high grade source. If you are using a high grade oil then the bark is ok to use in low doses, just 1 drop, internally, but it must be very high grade and specified as ok for internal use. The leaf is advised against for internal use. Neither oil is suggested for use in aroma diffusers due to the potential for irritation of the mucous membranes. So stick to topical only unless using very good quality Cinnamon Bark essential oil, even then never use in a diffuser. Both oils as has been mentioned are good for aiding in the treatment of Rheumatic issues including Arthritis. Their warming natures helping to improve sensation, healing and comfort of the areas treated topically. The leaf oil brings benefit in various ways with pain related issues and circulation. When the body is run down it helps to uplift and helps with glandular stimulation, plus relief from exhaustion and depression. You can discover more on Cinnamon Leaf Essential Oil Uses here. The bark oil is superb for aiding with cardiovascular disease and blood sugar levels, including diabetes, should you wish to work on this a high quality oil is strongly advised. It also helps with various viral infections, colds and numerous other issues. You can discover more on Cinnamon Bark Essential Oil Uses here.